Picture the scene. You’re drifting in intergalactic space. There are no stars punctuating the darkness, like there are here on Earth. Instead of stars, the points of light you can see are fuzzier looking. Far fewer points of light than you’d see from home here in the Milky Way, those lights you’re seeing are whole galaxies. Indescribably distant. You’re all alone, lost in the inky blackness of intergalactic space. There’s nothing out here but silent drifting clouds of hydrogen gas, and ultraviolet photons. Or is there? Suddenly, a bright light illuminates the void. A supernova. But where did it come from? That’s the puzzle that’s been perplexing a number of astronomers at the European Southern Observatory (ESO) for some time, now. Intergalactic supernovae, apparently orphaned from whatever host galaxy may have spawned them. But on closer inspection, it seems that at least one of these supernovae may not have been intergalactic after all. These images show a supernova named SN 2009z. 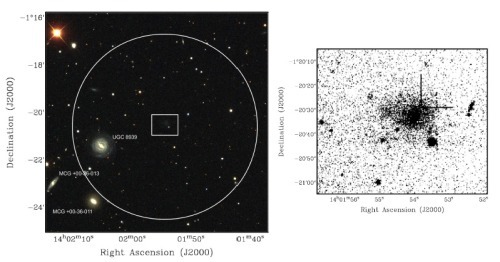 The left image is a sky survey image, with a box showing the location of the supernova. The right image is a zoom of the box, with boosted contrast and inverted luminosity to help see what you’re looking at. The cross marks the location of the supernova, but… The fuzzy blob there? That’s a galaxy known as N271, and the supernova seems to be associated with it. Mystery solved, right? Actually, not quite. 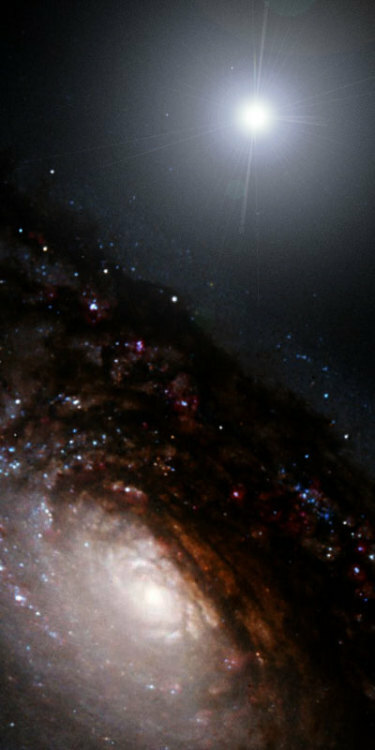 You see, N271 is a Low Surface Brightness (LSB)★ galaxy. It definitely isn’t a faint, distant galaxy either. With a redshift of a little over 0.2, it’s relatively nearby. As you can probably work out by now, LSB galaxies are so called because they’re, well, not very bright. These are believed to be old galaxies, full of so much dust that very little light reaches the “surface” of the galaxy☀. Old dusty galaxies are practically galactic corpses. Depressingly, they’re no longer capable of supporting much, if any star formation. The light seen from some LSB galaxies probably comes from the last generation of stars that galaxy will ever produce. Yes, in time, even the galaxies die. But there’s the paradox. This supernova was a type IIb. That’s an explosion caused by the death of a massive star — specifically a massive star which, one way or another, has been robbed of its outer layers of hydrogen. That normally only happens in binary star systems when a gluttonous companion star steals all of that hydrogen. Simultaneously, a stellar companion makes it hard to believe that this is an extragalactic star, but massive young stars shouldn’t be formed in an old galaxy like N271. In their paper, the group of ESO scientists suggest that this star formed in N271 during a brief starburst. A temporary flurry of star formation, before the galaxy quietened down again. They go on to suggest that if this is the case, then theories on the nature of these dark and dusty LSB galaxies need some revision. So if N271 went through a starburst phase, then what happened to all of the other stars? Only the most massive stars go supernova, and they’re also the shortest lived. A starburst in N271 should have left behind a population of O and B-type stars. Actually, that fits too. The authors of the paper find a relatively young age in the stellar population, based on the UV output (O and B stars emit a lot of ultraviolet). There is always the possibility that some intergalactic supernovae may be the death throes of hypervelocity stars. Violently jettisoned at speeds of several hundred kilometres per second, tens of thousands of such hypervelocity stars are expected to exist in the Milky Way’s halo at any one time. Supermassive black holes routinely fling hypervelocity stars out of galaxies♣. It’s also known that in massive galaxy clusters, trillions of intergalactic stars may exist, sometimes more than in any single galaxy in the whole cluster! But that can’t really be the case here. It can (and I’d be willing to bet does) happen elsewhere. But in this case, there’s nowhere else the star may have come from. Supernovae are essentially time bombs, and no other galaxy is close enough to have ejected this star. It would have exploded before it got too far away. Plus it’s obviously closely associated with N271, and arguing otherwise would be foolishness. I suppose (based purely on speculation), a hidden third option exists for the cause of a mystery supernova. A collision between two stars could, in theory, account for something like this. Two stars would collide and merge to form a blue straggler, causing their interiors to homogenise and allowing them to burn far more of the hydrogen the resulting star would have. This merged star would burn for a lot longer than most supernova progenitors, and if the two original stars were massive enough, the merged star may be massive enough to go supernova. In theory, this could create a type IIb supernova, but the chances of this happening are… well… astronomical. In short, I’d agree that the authors of this paper have done a lot of work on N271. Their theories, as far as I can see, are watertight. N271 did indeed go through a recent starburst (or is currently starting to going through one), and this is either it’s first such burst, or it’s been dormant for a long time. What could trigger such a burst? Who knows? Perhaps a collision with one of those clouds of intergalactic gas I mentioned at the start of this entry. And actually, personally I can’t help but find this conclusion rather comforting. Dusty galaxies like these may not be quite so dead after all! Lower – Manipulation (by yours truly) of the Black Eye Galaxy from NASA and The Hubble Heritage Team (AURA/STScI). I was originally going to credit The Daily Galaxy for my finding this story, but on closer inspection it seems they ripped off their article from one published by Universe Today a few months ago. For shame, Daily Galaxy! For shame! ★ Astronomers just love using arcane abbreviations for things. ☀ Technically, a galaxy doesn’t actually have any “surface” to speak of. It’s just a metaphor used in astronomy to make it easier to describe the brightness of any extended source, like a galaxy or a nebula. ♣ Rather like a very big and rather fearsome baby throwing its toys out of the pram. This entry was posted in Imported from Livejournal and tagged galaxies, stars, supernovae. Bookmark the permalink. 1 Response to Explosions in the dark…?